Preheat oven to 180°C (355ºF). Roll out dough on a lightly floured surface to 1cm thick. Press into a 20cm x 30cm lightly greased baking tray. 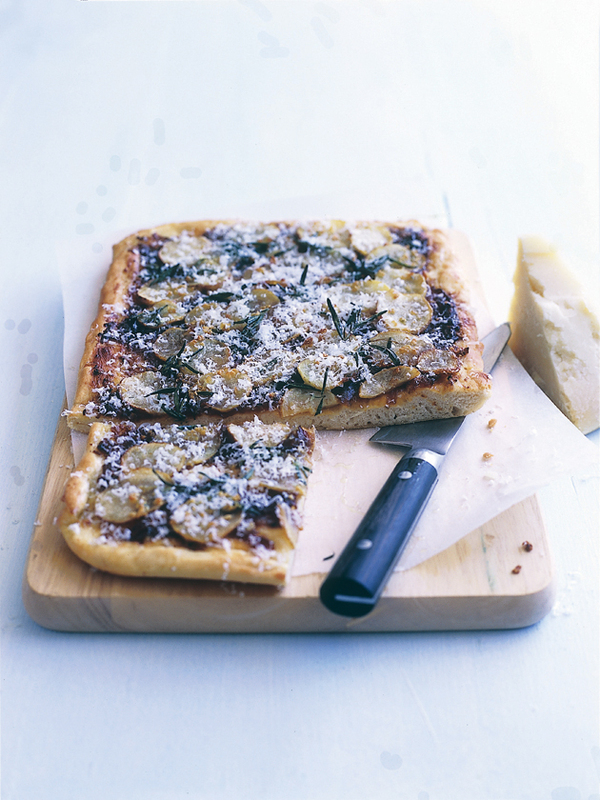 Spread with the caramelised onion, top with the potato and rosemary. Combine the garlic, oil and salt in a bowl. Spoon over the pizza and bake for 25–30 minutes or until golden and the base is crispy. Top with parmesan to serve. Serves 4. * Caramelised onion may be bought from specialty food stores and delicatssens. To make your own, gently fry onion slices in olive oil over medium heat until softened. Add malt vinegar, brown sugar and sea salt and cook until soft and sticky.